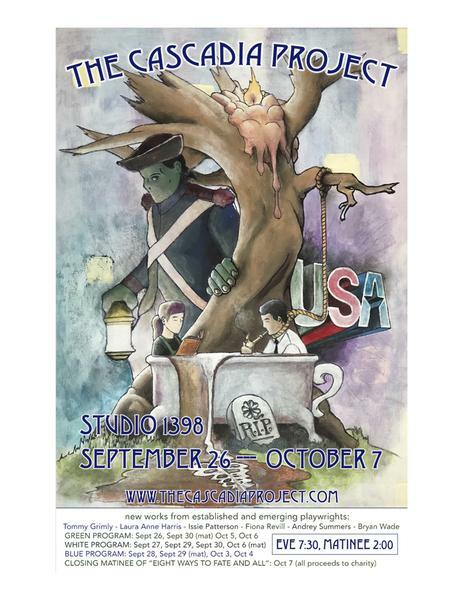 The Cascadia Project is a new theatre festival featuring the work of local playwrights. Founded by Bryan Wade, a professor of creative writing at UBC, the festival will showcase six new plays later this month. “... [The] goal is to provide a forum for emerging playwrights and experienced playwrights like myself,” Wade said. The idea for the festival came to Wade during a break in one of his advanced stage play classes. “It came up that five of us, including myself, had all applied to the Vancouver Fringe Festival, and we didn’t get accepted.” Surprised that not one of his students’ plays were selected, Wade half-jokingly brought forward the idea for them to pool their money together and put on their own fringe festival. His students liked the idea, and The Cascadia Project was born. “There’s a strong UBC element here,” Wade said, noting that the actors, directors and crew are also made up mainly of UBC students and alumni. The performance schedule divides the six plays into three different nights. All proceeds from the final performance on October 7 will be donated to three charities that offer support in Vancouver’s Downtown Eastside neighbourhood. Wade’s play, Eight Ways to Fate and All, is about illicit opioid abuse and features five actors taking on 20 roles. One of the disturbing things Wade found in his research was the lack of boundaries to opioid use in Vancouver. The Cascadia Project will be running from September 26 to October 7 at Studio 1398 on Granville Island.